Gavin Thrum’s Terowie North Layout showing his scratch-built T class 4-8-0 and Beyer Peacock 400 class Garratt 4-8-2+2-8-4 in HOn3 (3.5mm to the foot scale on 3 foot gauge track). There is probably no other hobby that has anywhere near the number of facets that can be found in the hobby of model railways. There are just so many choices to be made, interests to be incorporated into, and skills to be learnt when making a model railway layout that anyone who can master half of the skills and interests will indeed be a talented person. First then, let’s look at some of the choices which confront an intending modeller. Rarely will many choices be consciously made at the beginning of a person’s modelling career; the choices are usually distilled out as the person works out what he really likes. By this we mean, most of us started by acquiring models of several prototypes, several different styles of couplers, wheels and track and, occasionally, one or two different scales as well. The beauty of the hobby is that if you like it, you can run it ( well at home, anyway) and no one is going to complain that the rolling stock is from several different countries in the one train. On the other hand, if a person wants to take their modelling enjoyment to a higher level, then choices need to be made. What are these choices? Choose a scale. The majority of kits and models of South Australian Railways rolling stock and locomotives are made to what is called HO scale, 1:87 or 3.5mm/1ft, and there is a ready-made advantage in the number of bits and pieces that are commercially available in this scale. There are of course, advantages and occasionally disadvantages to modelling in other scales. N scale is much smaller and has the advantage of being able to fit much more into a relatively small space. A possible disadvantage is that it is harder, but not impossible, to accurately model in this scale. O scale is twice the size of HO. It is easy to make very accurate and detailed models in this scale, but parts in Australia are somewhat harder to come by for HO modellers. A disadvantage is that you need lots of space for an O scale layout. G scale is chosen by those who like outdoor layouts and by those who have difficulty in seeing the detail in smaller scales. Parts are becoming much easier to acquire in this scale. Choose a Gauge. Most South Australian modellers choose to model in HO scale on common, commercially available 16.5mm gauge track which represents 4′ 8 1/2″ gauge. But some modellers choose to model genuine 5″ 3″ gauge, which was the most common gauge used in South Australia until the 1970s. For narrow gauge a majority of modellers use the American HOn3 10.5mm gauge track, representing 3′ gauge, because of the availability of parts. But there are some South Australians who model on TT 12mm gauge track which more accurately represents the prototype 3′ 6″ gauge used in this State. In other states, S scale on standard HO gauge track is used to represent 3’6″ narrow gauge. Anyone really wanting a challenge could try modelling a break of gauge station, for which there were numerous prototypes in the state, including Port Pirie, Gladstone and Peterborough, all of which had three gauges at various times. Choose an Era. It is very difficult for a serious modeller to represent the prototype accurately unless all their buildings, vehicles, rolling stock, etc. comes from one era. Most modellers make compromises in this area, simply because there are just so many changes that it is almost impossible to stick to period when everything you want to put onto a layout actually existed in the form, colour and shape that you want. Older modellers who were around in the ’50s and ’60s will choose that era, simply because they can run both steam and diesel locos. Younger modellers may be quite happy to stick with the current day, because the number of quality models of current diesels and rolling stock is steadily growing. Choose a prototype. If a modeller chooses an early era, a prototype also has to be chosen since there was very little movement of rolling stock and locos between states before the 1970s. As you might expect we are promoting the modelling of things South Australian, although some rolling stock from Victoria did find its way into South Australia through border stations like Serviceton, Mount Gambier and Pinnaroo. There are plenty of modellers who have a favourite American system and model that, not to mention the legions of modellers from the United Kingdom, many of whom faithfully model a particular system. And how many exhibitions have you been to where there can found a European layout featuring Marklin etc. Most I suspect. Choose a Colour Scheme. Not everyone wants to model a particular system. Some modellers choose to invent their own and design a colour scheme to go with it. If, of course, you choose a particular prototype, say SAR, then you might require medium grey, light grey, AN freight red, green and yellow, and straight yellow just to mention five colour schemes used on South Australian rolling stock in the last 30 years. Choose the track. Track is a vexing problem for some modellers, especially if finer looking rail is combined with rolling stock with deep flanged wheels. Gauging wheels can also be a problem to ensure wheels don’t derail when going through points. If too many derailments are caused by incompatible equipment, a modeller will become discouraged. For HO scale, most Australian models are made to NMRA (National Model Railway Association) standards, which is compatible with virtually all brands of track, and buying equipment conforming to NMRA standards will ensure largely trouble-free operation. Choose a wheel profile. Different brands of equipment may come with different wheel profiles, which may cause problems with compatibility. Again the most common wheel standard for Australian HO scale models is NMRA, which performs reliably with most brands of track. Some British and European equipment however have deep and or sharp flanges which may cause trouble. NMRA replacement wheel sets can be bought and used to replace unsuitable ones. Whilst 26mm is the standard length of axles for HO gauge, there are a couple of shorter lengths in use, and the length required should be ascertained before trying to replace wheel sets. In recent times many modellers have been using a narrower wheel which represents the prototype more accurately. The standard NMRA wheel for HO gauge is what is called RP25-110, or 0.110″ wide. But their narrower RP25-88 wheel is also now commonly available and looks better, though they may cause some problem on track with wide flangeways. Choosing Couplers. There is absolutely no doubt that one of the most annoying features of model railways is the number of different types of couplers fitted to rolling stock. Virtually every modeller has had at least three different types of couplers, or have been through that many types before settling on the one brand of their choice. At least the Americans got it right when they standardised on a coupler pocket size in which most couplers could be fitted. While there are two chances, yours and buckleys, of getting all modellers here to agree on an Australian standard, we should encourage every manufacturer to produce rolling stock with a standard coupler pocket. Trax produce a coupler pocket that can take European, Hornby and X2F couplers, but fitting Kadee couplers still involves a minor surgical operation. 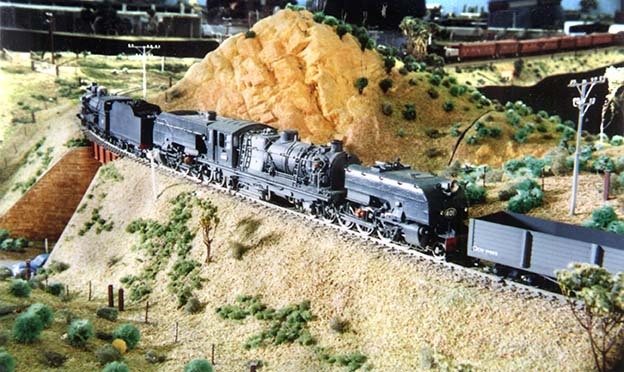 The majority of serious railway modellers in South Australia use Kadee couplers or the Steam Era Models Kadee-compatible type. Try not to let cost put you off good couplers. Well, so much for choices, now for the skills and interests that can be incorporated into the Hobby. None of these however are essential. Travel. Travel to see and photograph the areas or items you are thinking of modelling is desirable. There is a choice of choosing to make everything in a particular area, or to choose just one item such as a building, a bridge or some other item of interest. Even travel overseas or interstate is likely involve a look at railway activities and travel on a preserved line or two. OK, so your tour pulls up at the Cologne Cathedral. What is more important, looking at the Cathedral or nipping into an extremely busy railway station next door? Travel to different destinations with a group of friends to display portable layouts can also be a rewarding, not to mention a very tiring, experience. Photography. Anyone can take a photo, even a reasonable quality one with a modern day automatic camera. It takes skill however to get useful photos for modelling purposes, and even more skill to take clear close-up photos of models (railway variety thank you!). The photos we take can be used to help make models, to illustrate articles, and of course, to illustrate talks. Rally Driving and Cross Country Running. Ever tried to keep up with a steam train or, for that matter, any sort of train, get out of the car, run to the side of the track or other photographic advantage point, take photos, run back, get back into the car, get in front of the train again to take yet another photo? Drawing and reading Plans. Not everyone draws plans, but most of us that make models need some form of plan to model from. We suggest that everyone should have a go at drawing one plan. It is just one more skill to be learned and mastered if a person is to be a complete modeller. Enhancing an existing line diagram is a good starting point, or drawing up a complete loco by measuring it up at a museum can be at the other end of the challenge scale. Plenty of plans can be purchased, but invariably need to be rescaled. Plans are also required to illustrate articles. Making Models. Perhaps the crux of the entire hobby is the actual fabrication of a scale piece of model railway or ancillary equipment. There are plenty of kits from the easiest plastic kits to the hardest metal locomotive kit. Wood, brass, styrene plastic, cardboard, balsa, home made castings, are all basic modelling materials. Making houses, structures, scenery, track, anything and everything that exists on this land can be modelled. How many other hobbies can claim such a wide variety of things to make. N scale modellers in this state have even incorporated a model aerodrome complete with planes and a model dockyard complete with a dry dock and several naval vessels into their model railway layouts. And having made the models, they don”t become a static display. They can be run on a layout and, if individuals don”t have room for their own layout, on one that belongs to a club or one owned by a friend. Carpentry. A definite skill is required here, especially to make the baseboard, and sometimes the building to house the baseboard. Many layouts are made to be portable, so that they can be exhibited at different exhibitions and stored in a special trailer. Making a layout strong enough to be winched up to the ceiling of a garage is always an option. Collecting. Yes, there are some armchair modellers who are all thumbs and who just have an interest in collecting railway trains, locomotives or other paraphernalia. Some modellers collect models of particular prototype. Some collect models as an investment but, like many investments, there is a very definite risk that the item will go down in value rather than up. Electronics. A basic knowledge of electrical wiring is required by the average modeller, but complicated electrical circuits and control systems can be incorporated into the hobby for those who have more than a casual interest in this side of the hobby. Some clubs have had a number of construction nights where a complete novice in the form of the writer can still manage to solder wire “a” to tag “a”, etc., and end up with a controller that works. There is now a special club in Adelaide that caters for Digital Command Control (DCC), an advanced electronic method of controlling a number of locomotives (at the same time on the same section of track), and up to a dozen accessories on each loco, all with one controller and two wires to the track. Painting. Artists do not have a monopoly here. Some model railway ” back drops” put Hans Heyson paintings to shame – well, almost. Painting, including “weathering”, can turn a mediocre model into a work of art and vice versa. Getting scenery colours to look realistic is a real skill. Learning to paint with a small airbrush takes time and patience, as does masking out models before they are painted. Research. Whilst history was viewed by the writer as the most boring subject ever studied at school, as I got older, I discovered almost too late that history can be extremely interesting. In many ways Australia’s history and that of its railways were closely interwoven for the best part of a hundred years. Knowing the history of that which one models not only adds an extra dimension to the hobby, but can assist in a more accurate portrayal of the prototype. Research is obviously needed if preparing articles for publication or talks to groups. Operating a model railway. How many of us are accused of playing trains? Is it jealousy or what! Irrespective of whether it is considered to be “operating” or “playing”, there is still a skill in working a scale model railway properly. Not only do the trains have to be kept running on time, (to a “fast clock”) but the wagons shunted to their proper destinations, the electrics properly set up en route, an eye kept on the other operators and their trains to ensure smooth crosses, the proper wagons picked up, and the maximum tonnages and length of trains adhered to. And the proper locos allocated to the correct trains. Planning a functional timetable for a particular layout must also be considered a skill in itself. No wonder some school teachers consider the model railway hobby to be an important teaching tool. Such operations are not obligatory. Many modellers are happy just to watch trains go around and around, happy in the knowledge that there has been a lot of work to get the models to the stage where they run. Isn”t it the same with racing cars, horses or greyhounds? It’s not just watching them go around and around, it”s the knowledge that there has been a huge effort to get these to the stage where they are a credit to the owners, trainers, makers etc. Sharing. Sharing the trials, tribulations, achievements, and the research can be a great part of the hobby. Whether it is by writing for one of the many magazines, contributing a plan or photo, demonstrating a technique at a workshop, exhibition or convention, running a train at an exhibition or making a master from which hundreds of models might eventually be made, the opportunities to share a great hobby with others are boundless. What magazines should South Australians look for? The Australian Model Railway Magazine, published bi-monthly since May 1963 is a start. 250 issues have now been produced detailing all aspects of the hobby in Australia; Catch Point a glossy magazine produced by the National Railway Museum at Port Adelaide in conjunction with the Australian Railway Historical Society. Pichi Richi Patter, a bi-monthly magazine of the happenings of the Pichi Richi Railway Preservation Society, has articles on railway generally. The Buffer Stop is a magazine that has been published monthly since June 1957 by the South Australian Railway Modellers Association. Narrow Gauge Downunder is printed and published in South Australia for those with a particular interest in the skinny gauges. And do not forget magazines and newsletters published monthly by SANGS, the N gauge society, and Decoder, published by the Digital Command Control group. Cost. Finally, having been through some of the skills, what about cost? Is the model railway hobby expensive? Well, it can be, but we suggest that the average modeller who makes his own equipment would probably not spend more than the average worker would on a few beers or a couple of packets of cigarettes a week! So, where do you start? Well there are plenty of model railway hobby shops and clubs in South Australia who would love to talk to you about where to start. Swap meetings are held three or four times a year in or near Adelaide. Why not look at good quality second-hand equipment.